Umbra is an action-RPG being developed by French studio Solarfall Games that will take a run at Kickstarter next week. 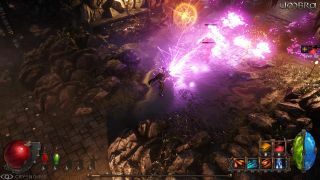 In advance of that, the studio has released a gameplay video demonstrating two of its foundational mechanics: The "Resource Opposition" system, and "Elemental Effect Interaction." The Resource Opposition system is designed to "provide balance to the freedom of character development that the player has," the studio explained, by imposing a penalty on characters when a particular resource—essentially a powered ability—is used. When your character performs a melee attack, for instance, his Rage stat will increase, but Stamina and Mana will be lowered, as will their regeneration rates. "A similar process happens with all the other resources," the narrator explains. "It is up to you to find the way you want to play, but remember: There is always a price." Elemental Effect Interaction, meanwhile, is just what it sounds like. Fire, water, lightning, and ice will all interact with one another; freezing an enemy leaves it susceptible to bonus melee damage, while water can douse fire, making it less effective in a fight. The system appears very similar to the one used in last year's Divinity: Original Sin. More information about Umbra, which will feature open-world gameplay and a "free-class character development system" with highly customizable weaponry, is up at umbragame.com. The Kickstarter will go live on May 13.